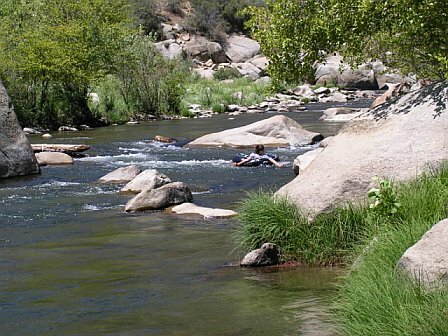 Camping at the Kern River begins this Friday for me and my family. I love our annual camping trip! We love to play board games, at night, with the lantern to light our table. We love to sit around the camp fire and tell good family stories. We love getting our River Rat Inner Tubes and glide down the water. I love the smell of eggs and bacon being cooked over the morning fire. And to sit and drink a fresh cup of coffee in a natural sitting… priceless. I was browsing for Frugal Camping Tips and came across this great list of (rather innovated) frugal suggestions posted on the Mountain Survival website . The original file for these low-cost equipment/ideas/fixes for Scouting and camping in general was originally found on a F-Net Scouting board and was reposted on Fidonet on Nov 11/92 by Steve Simmons. The file evidently originated with BSA Troop 886 in the USA. Canning rings can be use to cook your eggs in for egg sandwiches. Use a large zip lock plastic bag, filled with air, as a pillow. I use a rolled up towel, but this might work. Use a cookie tin as a Dutch oven. Laundry lint makes good tinder. Water proof matches by dipping them in nail polish. Save inner cardboard tubes from kitchen and toilet rolls, stuff with waste paper and use as fire-lighters. When using a bucket for a messy job, line it with a plastic bag which can be thrown away afterwards. The little plastic tags from bread and bun packages are great for pinning up wet bathing suits and towels at camp, and they take up a lot less packing space than clothespins. If you like these, check out the entire list. I need some more great tips. Have any innovative camping wonders? Or even if you’d like to share you fond camping memories. Love to hear them! And of course, I will bring back and share some wonderful pics from our camping trip, if you’re interested. This entry was posted in The Daily Grind on 2009-07-12 by Christine. great tips! i need some help w/# 10 … i don’t quite get it. how will the plastic tie help w/hanging up bath towels? where are you all staying this weekend? a tent, cabin? We are staying 4 days in a tent placed feet from the water (the sound of the water is a great natural sleeping aid!). Gonna be hot during the day but perfect at night. #10… the little plastic tabs, not the twisty ties. I’ve used them before for this purpose. Can hold light towels, but does great for the suits. Use a thin nylon string tied from the tent to a branch, hook a plastic tab and there is still enough room to hook suit. Of course, you could just throw the suit over the line, but tabbing it allows the whole suit to dry fast all the way thru. Then again, the heat we will be in this weekend… will dry any thorough in a flash! LOL. Sounds like a great time! Can’t wait to hear the details when you get back! I don’t know if you can see… but that is my son tubing down the river. I can’t wait. I decided that I am going to the trail of 100 giants. Can’t wait to get some pics! I’ll be sure to update! Great tips! Thank you! We have just been talking about going camping. I love camping. Did you see the great big list? They have some great ideas. Oh, if you go camping soon… have a great time!